I was hoping one of you may be able to help Vintage Indie reader Patti M. with her vintage tablecloth cleaning question. Patti writes, " I was wondering if you might be able to offer some advice or suggestions to remove bleeding stains that occurred after washing a vintage tablecloth. This tablecloth is so precious to me and my sisters that I am very upset. My parents are both deceased. When going through "the hope chest" we discovered a beautiful silk (I think) embroidered tablecloth that we are pretty sure my father brought home from WWII . We had never seen this gorgeous piece of linen. I suspect my Mom thought it was too nice to use. I decided we need to enjoy this piece so used it for our Thanksgiving meal . I washed it in cold water on delicate cycle only to have the wine color from the embroidery thread turn the beige background pink. I immediately ran it through the delicate cycle again with no detergent this time. No improvement noted on the bleeding. I hung it outside and am searching for a solution." Thanks everyone, I hope we can help Patti! I should have read a little more into this, it was fabric bleeding! If you are new to the magazine, Making the Most of Monday is a regular part of our features. Mondays signify one important thing, a fresh start. It's like a new years resolution at the start of every week. Hopefully by Monday you've taken some off time during the weekend to rejuvenate, spend quality time with loved ones and friends, which makes Monday your chance to really get to work and make the most of your week. If you missed the last Making the Most of Monday click here for "Set Your Own Pace"
I posted to Twitter this morning, " What kind of encouragement do you need today?" Often times, I look to others for encouragement in many areas of my life. Whether it's fairly simple topics like restoring a piece of furniture or more serious areas like, parenting, working from home etc. What area in your life are you seeking encouragement? I'd love it if you could post them below and maybe myself or one of our lovely readers can help. In the meantime, here are a few places I visit for encouragement. I realized that this list could go on and on so I had to stop here. So what kind of encouragement do you need? Have a great week, I look forward to this discussion with you. Glenna from Glenna's Garden wrote, "Hi All! I was wondering does anybody know when jewelers started using the lobster claw on necklaces, thanks. " We asked our previous guest reporter Sandy Garrision if she knew anything about the lobster claw. She replied, "Our Chicago show neighbor is a jewelry dealer. He said he's not positive, but his best guess is that you start seeing lobster claws in the '40s, but that they were not commonly used until the '70s. Hope this helps! Sandy Garrison/Rhubarb Reign." Does anyone else have any other information for the lobster claw? Please feel free to include them in the comments section below. How did you get started collecting doll houses? When I was 9 or 10 I found an old dolls' house in the next door neighbours' shed which they let me have. What's your favorite item out of the collection? What's missing from your collection, that you dream about having? If space and money were no object and I could magic up items from my wish-list: a Triang suntrap house, a flat roofed Lundby from the 60s, a Brio bungalow, a Jenny Home house, a custom made apartment block that I've been thinking of making for about 20 years, and a Mark Turpin original. And that's just the houses! What do you think makes a great collector or a great collection? A great collector loves what they collect. I was going to say they'd be knowledgeable about their collection and willing to share that knowledge but I suppose that's an individual choice. Some people collect things just because they like them in a scattergun approach and others are more disciplined and scholarly in their collecting pursuits. Anna-Maria had the pleasure of sharing her collection in the exhibition "Playing House": contemporary dolls' houses 1957 - 2007"at Canberra Museum and Gallery Be sure to click on the link to see more of her collection. Also, a special thanks to Anna-Maria for a peek into her wondrous homes. It was so hard to choose photos from her collection to show you, so be sure to check out her Flickr Sets, lastly visit her blog The Shopping Sherpa to here more in depth details of her collection. Reader Discussion: The Results are In: What Does Vintage Mean to You? Looks like the majority says that vintage means enduring interest, importance or quality. We'd like to keep this discussion going. What sorts of vintage peeks your interests? Tags: reader discussion, vintage, vintageindie, What Does Vintage Mean to You? We are still celebrating birthdays around here, in fact here at home we celebrated another one my grandmothers this Valentine's Day. I'm still in the birthday spirit, and I hope you are as well. Our contributing editor Elizabeth Young always has so many wonderful collections to share with us. Today she's sharing her vintage birthday collection. Lots of vintage eye candy here! Be sure to click on the images to see everything larger. Party Cups & Napkins - Party Game! Thanks Elizabeth for sharing your fabulous birthday goodies collection with us! Elizabeth Young is a wife and cat mom who spends many an hour hunting for vintage goodies at her favorite thrift stores, antique shops and monthly flea markets! A collector of vintage toys, holiday decor and general store items, many of the found treasures end up on display in her Victorian home. 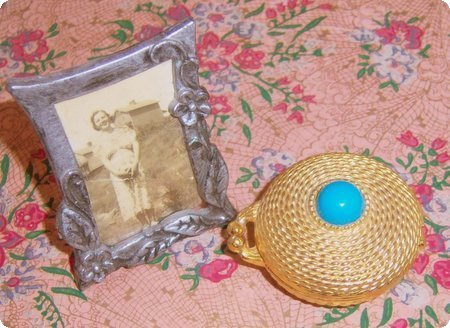 She also looks for vintage ephemera, fun supplies and kitschy decor for her Etsy shop Grandmother's Attic ! When not doing this, she works two part time jobs, wearing different hats at each! What made you start collecting vintage sewing baskets? I love going to thrift stores, rummage sales and trunk sales searching for treasures. A few years ago I noticed a few vintage sewing baskets and the very low price they were asking for them. There are few bargains in the vintage market but I feel that sewing baskets are still very affordable and functional. I like to imagine the woman or girl whose basket it was, what she kept in it and what marvelous articles she created with her own two hands. 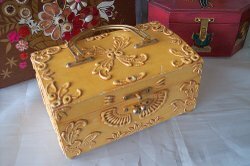 My favorite thing is the hand painted wooden box that I bought at the flea market in Vienna . It was the best one euro I have ever spent. It was filled with treasures and I have kept it just the way I found it. I usually don’t try to dream of adding a particular item to my collection. One thing I am collecting now and in keeping with the theme are those tiny little vintage containers women kept their needles and some thread in. I am smitten with those. It is when you least expect it, some times in the most unusual places that you discover treasures. I think it is best to keep one’s mind and keen eyes open to the possibilities. Whenever I go to a rummage sale I always look under the tables. I have found many a treasure there and sometimes they just give them away. A great collection can be anything you love and enjoy looking at and studying. Collections should always be displayed somewhere and shared otherwise what is the point of collecting. Be sure to visit Margaret's Etsy shop Resurrection Fern for her beautiful photography and more. Do you have a vintage collection that you would like to share? Send us your submissions Subject Reader Collection. 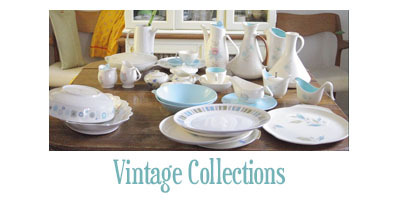 Vintage Indie would like to welcome Denise Couling for our latest Reader Collection feature. Denise Couling is an attorney and the founder of Just So! , a jewelry design studio in Brighton, Michigan. An avid collector of vintage wax seals, her collection makes for great eye candy. Denise has turned her love for these seals into an art form while creating jewelry from originals and her own designs. 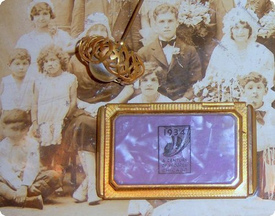 Above: Victorian-era British glass seal set in its original box (top left). French seal “Pez machine” in sterling silver (bottom left). A variety of other gilded, brass, glass and semi-precious gemstone seals (bottom right). What made you start collecting vintage wax seals? It really was my love of jewelry that led me to collect vintage wax seals. I was hunting around for a special idea for an interchangeable earring base I was designing. I definitely wanted a timeless silver “coin” look. I found a vintage seal set with “portraits” of Roman gods and then worked with a fine jeweler to create the finished project. Although that project moved me closer to seriously pursuing my interest in jewelry design, the seals themselves just intrigued me. My husband, who is from England, has become almost as fascinated by antique seals as I have and helps me look out for new seals and research them. I love how vintage seals can be very clever and they’re not all sugary sweet—sometimes the motifs can be very funny or irreverent. I particularly love the fact that so many Victorian-era wax seals specifically were designed to be worn as jewelry. I think seals are irresistible because they still are wonderful to use in creative projects today. Probably because it makes me smile, the individual seal I like the most depicts a wheat sheaf and says: “You Deserve Thrashing.” It takes people by surprise, I suppose, because they often expect something sentimental. I always love it when someone looks at that seal, reads it and starts to chuckle. Above: The amethyst glass seal reads “WHO THE [DEVIL] CAN THIS BE FROM?” and the citrine-colored seal shows Cupid catching a fox (on what looks like a leash). It says “I CATCH THE MOST CUNNING.” Sometimes, there’s no escaping love! My very favorite wax seal set was this year’s Christmas present from my husband. It’s an amazing collection of faceted glass seals from England from the 1800s, still in its original silk-lined leather box. A close second is a French seal set in sterling silver. It is a true work of art (with 26 beautiful seals in the handle). It works something like a Pez candy dispenser. Every seal in these two sets is a treasure. They must have been prized possessions for their original owners … and the seals were charming little messages and puzzles to send to their friends. ABOVE: A sample of my collection of vintage brass seals, including one from Italy, a collection of Edwardian alphabet seals and a favorite “cherub” seal (bottom right). What is missing from your collection, that you dream of owning? For me, the most tempting seals have charming messages and were designed to be worn as rings or pendants. In Victorian times, wax seals occupied a really interesting niche where correspondence and writing instruments often converged with jewelry. They sent a message about the owner’s education, personality, family ties and even social status. I have seen some wonderful jeweled seals where a faceted amethyst or citrine has been carved with a clever motif or family crest. I would love one of those, but I might have to settle for seeing them in a museum or collector’s guide! ABOVE: My beautiful French “Pez” seal. The French phrase with the bird flying out of the open cage (left) means, “Whoever neglects me loses me.” The center seal depicts Aesop’s fable of how, after a lion showed mercy on a mouse, that mouse one day saved the lion’s life. (I suppose today we’d call it “karma.”) I love the seal with the fairy flying by the candle flame (right of center). It says “Illusion.” The seal at the far right refers to a poem by Lord Byron, celebrating the lasting nature of friendship. This is such a sophisticated set, yet it is every bit as charming as it is elegant. What makes a great collection or collector? I think collecting is great when it’s as much about sharing as “owning.” Long before the gummed envelope existed, wax seals added real charm and personality to a hand-written letter. These were little messages and puzzles that were intended to be shared among friends and loved ones. I am always fascinated by how relevant these vintage seals still are today. You instantly grasp their emotion and humor. When these antique seals sit in a collector’s drawer, it’s a bit sad. So, I think the ability to transform these tiny treasures into something that others can enjoy today is my privilege. It’s my way of not only enjoying the process of collecting but of breathing new life into them. Above: A beautiful seal with a cherub and a lion became on charm on this collection of Pearl, gemstone and sterling chain necklaces. We would like to thank Denise for sharing her extensive collection with us. We encourage you to head over to Just So! She offers a beautiful bridal collection as well as many other wax seal styled jewelry. What made you start collecting your antique and vintage floral and woman portrait paintings? I love art but unfortunately (quite early on) realized that I was no good at it myself. So I decided to collect rather and have now collated gorgeous collections. I remember in my grandparent's home - on an isolated farm in South Africa in the early 60's (which had all the decor that I lust after now: embossed wallpaper, antique brown furniture, Persian rugs, dark oak wooden floors and picture railings) they had a painting of a woman playing the piano. It was an old painting and I was desperate to have it. (Unfortunately, my mother who does not have any nostalgia or sentimentality didn't bother keeping it for me) so I decided to find my own. I collect mainly art deco period women on canvas and antique and vintage roses paintings. I particularly like the copies made my the Victorian ladies of the American Impressionist ( originally from France) Paul De Longpre and the fabulous Catherine Klein. My favourite item is a roses painting bought in Australia (one of the few I have found here as I mainly buy from America) which is signed and dated 1909. I don't have any information about the artist but I continue trying to find out. I love the colours, the size and the way the roses are lying on the table in a relaxed and casual manner. But, I must say I love all my paintings and am very attached to them. My husband says, that when I die, they are all going to be converted to cash!! (I have collected a whole wall of vintage floral paintings for my daughter and I love that collection, but she doesn't want it anymore ... so I guess you can't collect for your children). Perhaps my husband is right. What is missing from my collection, that you dream of owning? I suppose an original 1900's roses painting by someone like Paul de Longpre or Catherine Klein but I must say, I think my collections are almost complete. I have absolutely no space for anymore! 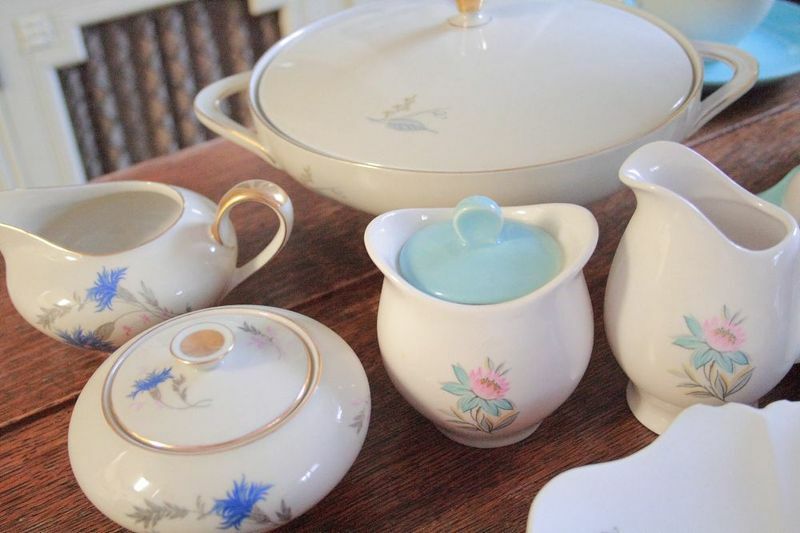 I'm not sure, but I think that you really must try and buy the best you can afford and rather start with a small collection of gorgeous items than just any old item that fits the collection. I have definitely sold more paintings than I have kept. Also know when enough is enough. I'm not sure about every wall being covered with the same type of thing. Move on and find something else to collect. My roses paintings are a favourite, but then of course, I also have vintage hat blocks, antique sterling silver boudoir jars, antique French perfume bottles, antique needlework, antique fabric, modern Australian paintings, antique boxes....... oh, the list is almost endless. A special thank you to Tracey for sharing her beautiful collection with us. Please be sure to check out her lovely blog, Live a Fabulous Creative Life. It's been a little while since we've featured a reader collection. I hope you enjoy this one from Clara Lidstrom of Sweden. VI - What made you start collecting these? I always liked pretty vintage things and when I stumbled upon some beautiful tins at an old relatives house I was delighted. So I started collecting them, and I never paid more than five dollars a piece. Most of them I got as gifts from friends and family and I use them to store anything from jewelry to food. VI - What's your favorite tin out of your collection? I love this blue tin that once belonged to my grandmother. I use it to store crisp bread and biscuits. VI - What's missing from your collection, that you dream about having? I don't really feel that I am missing anything in particular. I buy whatever I like without giving it too much thought. VI - What do you think makes a great collector or a great collection? A complete collection means nothing compared to a collectors taste and ability to pick out the best pieces.There are plenty of tins at vintage stores so you have be quite picky, unless you have a huge storage space for your collection. Did you participate in the Reader Discussion Part I ? If not, head there now and leave comments. I'd really like to know, What does it mean to you to "live green" ? Please feel free to join in discussion all this week in the comments portion of this post. Today I'd like to discuss going green & eco-friendly back to school. I just looked at the calendar and realized school starts NEXT WEEK!?! (Yes I meant to scream) Where did the summer go? Seriously, I thought school wasn't supposed to start until after Labor Day. What about you, how much time do you have before school starts. I'd like to know how you handle back to school blues. Finding an eco-friendly backpack isn't easy or cheap. Any good sources? I came across this fabulous blog post over at Nature Mom's Blog. Back to school Green Style. I've been to every site there and have throughly researched backpacks and lunch boxes. My questions to you, and Nature Mom please feel free to let us know what you think. I have my son's school list of what's required. Many products listed aren't so eco-friendly or maybe I need some direction (where to find the alternatives). What do you do when the school requires your child to have products like Red/Blue Folders, Zip Bags (even naming the brand of what to buy) as well as paper towels, plastic pencil box and more. Do you just give in? How do you stand true to natural and green living for your family all of the time? I know the words natural, green and organic seem to be flying out of the mouths of everyone these days. Not only is it important to find the true meaning of each of these words but to incorporate them into our lives. 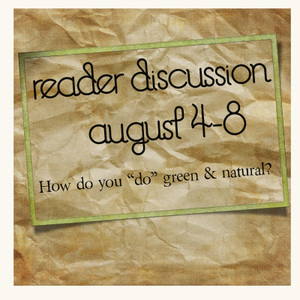 I hope with this weeks series on Green & Natural living you will learn something new about these topics. What does it mean to you to "live green" ? Thanks Shabby Miss Jenn for all of the beautiful things you offer that are now being used to beautify Vintage Indie. I think I can safely say that all of us have visited a market, yard sale, antique show or thrift store at one time in our lives. 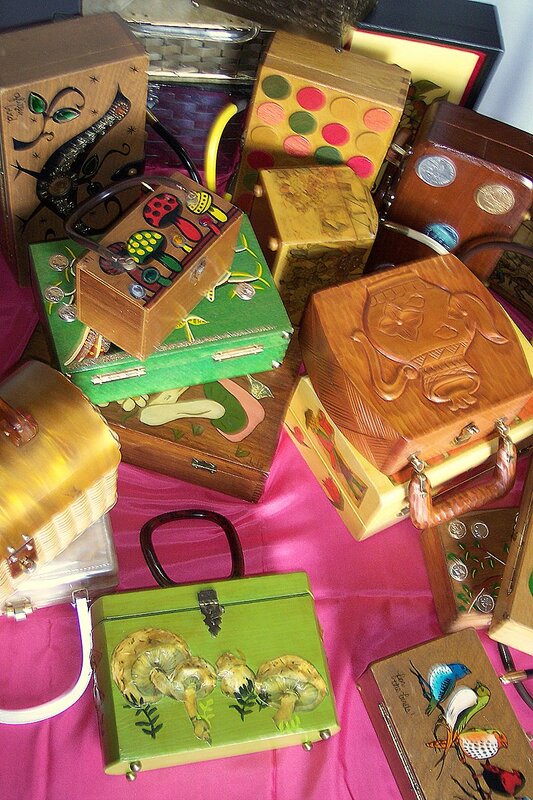 We all love to scour and hunt treasures of all kinds and they probably vary from person to person on what we look for. So what happens to those items that we are ready to part with or in my case no longer have room for. The cycle continues and we prepare for our own yard, garage and tag sales. 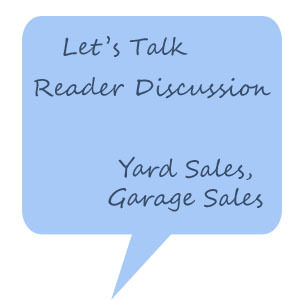 I'd like to start our first ever Reader Discussion with you on the topic how to have a successful yard, garage or tag sale. I'm preparing for my first yard sale outdoor vintage attic sale along with my savvy mother-in-law. I've been doing my research and have taken the first step in to having my sale which is obtaining a permit from my city and advertising via the local paper and other venues around town. I know from experience, that I really enjoy sales that are organized, eye catching and no sign of four legged hounds ready to pounce. To me there is nothing worse than starting your day with someones puppy muddying you up and scratching your legs ( I know this one from experience). No doggie here and don't get me wrong love the furry friends, but I like to shop without worrying about them. 1. Price Tags? Stickers or nothing "What's the price on this" ? 2. Light music in the background? 4. Haggling, yes, no make me an offer? 5. Organized? by vignettes, price, item. 6. What about a sale that's actually good and not a bunch of junk. How do your determine a price? 7. How to price children's clothing, adult clothing? I didn't advertise clothing because I don't have a lot of it but I do have some. Me personally I skip the sales with all the clothes it's just overwhelming to me. You? Share from your experience your likes & dislikes of buying and selling at a personal home sale. Good morning everyone! I'd like to introduce a new feature on Vintage Indie. "Reader Discussions". I'd love to hear your thoughts about our philosophy here at Vintage Indie. Modern Life, Vintage Perspective. There are many subjects that fit into our style and some that I'm personally very passionate about. What do you think about this new feature. Please participate in this short reader poll. Business owners Shauna Alterio & Stephen Loidolt not only have an amazing line of indie goods that they sell in their shop "Somethings Hiding in Here, but a fabulous set of various collections.Take a tour with me through their various collections and their beautiful home. any time we find two of something - they just seem to want to be together. the next thing you know, we have a collection of them. there are certain colors we love, it might be a material, or something that the object reminds us of. VI - What's your favorite item out of the collection? this changes everyday. i really love the globes, because they were a gift from my parents. during a recent visit, they drove to our place with a car full of vintage school globes. it was pretty amazing and the best surprise ever. the colors from the globes have inspired everything in our loft. well, we are currently obsessed with knots from wood. we are always looking for them and they are pretty tricky to get loose from lumber. but, it's so worth it - they are really beautiful. any thoughtful grouping of objects is a great collection, i think that it is the collector that makes it great. hopefully, the collector has a specific point of view about that object that makes the collection feel different from another one. Be sure to visit Something's Hiding in Here this weekend if you are attending the Brooklyn Renegade Craft Fair, tell them you seen their awesome collections on Vintage Indie! I spotted this fabulous camera collection on Flickr and wanted to know more about it and the person who loves and takes care of all of these. Please help me welcome Marcia to Vintage Indie. VI- What made you start collecting these cameras? and 2nd hand shops, garage sales and markets. In regards to "vintage cameras"
My first love was a 1950's era Bakelite oval shaped 127 Kodak brownie. like this one ... I snapped her up and went on a google mission to find out all I could! that I didn't already own while he was on a holiday!! bit of charm and character. collection I can actually use! also anything LOMO .. i love to experiment! aesthetics, what do I like, what has character, what can i use! ostracised??? Go embrace your inner bower bird!! Thanks Marcia for a fabulous interview and a peak at your collection. You can find some of Marcia's experimental photography here and her blog The Adventures of Mac & Ruby. Welcome to another Vintage Indie reader submission, Vintage Collection Feature . Today we are visiting with Rachel from Tigerluxe. 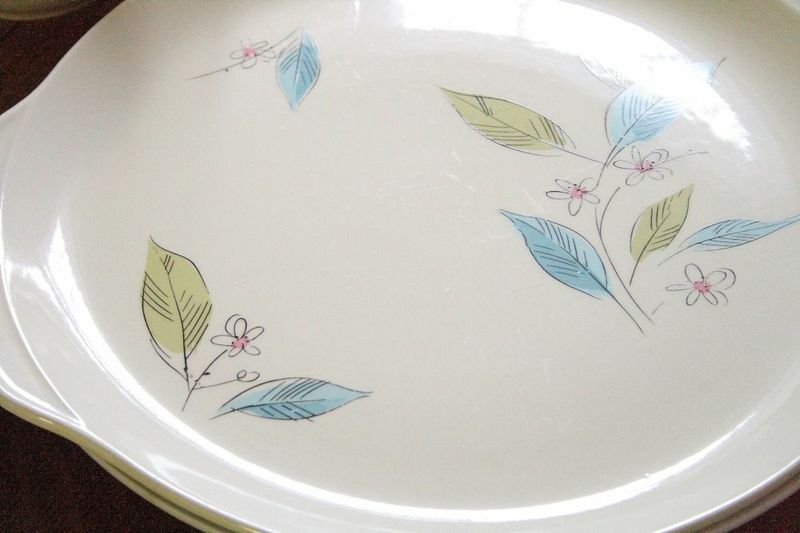 She has a gorgeous collection of various vintage dishes that she would like to share with you. I hope you will enjoy peeking into her collection and finding out more about it. VI - What made you start collecting these dishes? Colorway and pattern, and started seeing similar patterns and Colorways like Taylor, Smith & Taylor's Ever Yours "Boutonnière," which matched really nicely. 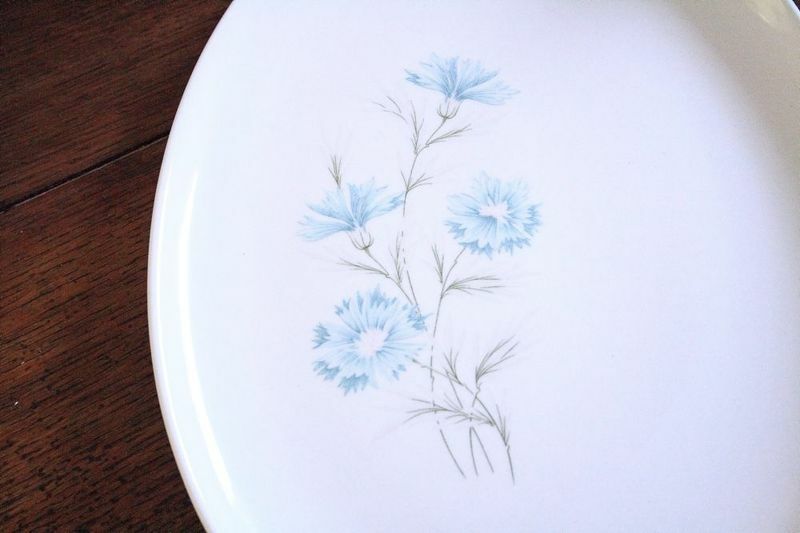 I also have a thing for Bavarian china, which often has a cornflower, bachelor's button, or dianthus type pattern in similar colors. and a collection was born (even though i didn't need any more china). VI - Do you know any of the history behind your collection? Rachel - I've done some basic research, I know that Ever Yours "Boutonniere" dates to the mid '60s and Fairlane dates to the late '60s...it was really hard for me to track down any information when I first started collecting. Now there seem to be so many more resources. 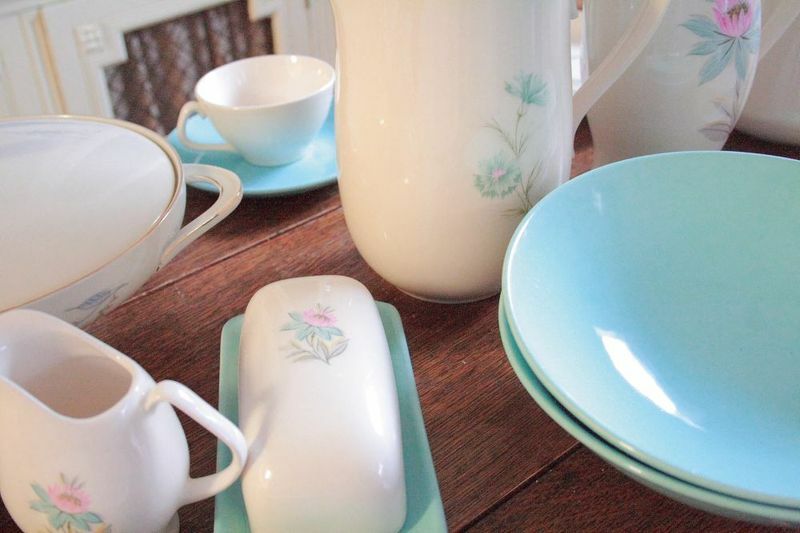 I have some pieces of Fairlane that were from my friend's grandmother's set, he had grown up eating off of those every Sunday morning for brunch. VI - What's your favorite item out of your collection? Rachel - The pieces that I keep out to look at and appreciate are my favorites (I have tons in storage). I can see my china cabinet from my living room sofa, and I often find myself looking in their direction. It's kind of strange I suppose, but they really are pretty to look at. coffee pots, tea pots and sherry decanters are always a favorite of mine, mostly the fancy stuff. Rachel - I would love to find a forgotten garage somewhere that held the whole set of each pattern in its original boxes, but that's like finding the pot of gold I think! I’m happy with what I already have and whatever I find. I have a kismetic philosophy when it comes to collecting. and can let go of it all. A special thanks to Rachel for sharing her fabulous collection with us. Be sure to visit her vintage shop Tigerluxe. You never know when a piece of your collection may just show up! 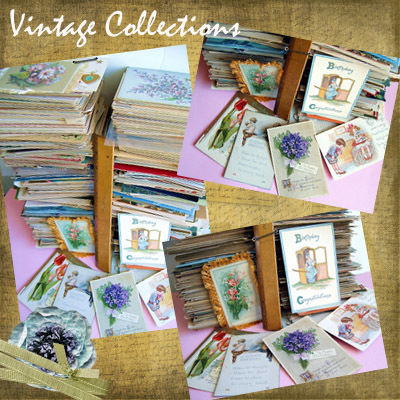 Welcome to another Vintage Indie reader submission, Vintage Collection Feature . Today we are visiting with Christine from Tangerine Chic. She has a gorgeous and quite large collection of vintage and old post cards. I hope you will enjoy peeking into her collection and finding out more about it. Vintage Indie : What made you start collecting postcards? Christina: I started collecting postcards after inheriting some from my dearest grandmother when she passed away 5 years ago. While going through her house deciding what to keep and what to sell/giveaway, I came across a small index file cabinet in her basement that was full of vintage and 1970's/60's postcards. I actually looked at quite a few and was sorting them out when I decided to just keep all of the vintage cards and the ones that she had of San Malo, France where my family immigrated from. Vintage Indie: What kinds do you normally search for? Christina: Honestly, I have not found many cards that I felt were worth buying. They must be from the 1910's to the 1920's if they want to hold a spot in my collection. I have Christmas, New Years, Valentines, St. Patricks Day, Easter, Birthday, and Thanksgiving. I think I have some few random ones in there that are just greetings. I also have a hard time knowing if I already own a particular card as I have at least 1,000 of them. I really need to take the time to get them into some sort of archival file system so I truly know what I have and how many there are. I truly hoard these postcards for myself. I could never sell them because of the emotional attachment they have to my grandmother. Plus, I just love the images, colors, little notes on the back . They even have a certain "vintagey" smell that reminds me of playing in my grandmothers basement when I was little. My girls and I will sit around and sort them into favorites by holiday and they will ask me to read what is written on the back of them. I also have used copies of the originals in some of my collages and cards that I sell. I have thought about making laser prints of some of them and selling them so others can have a piece of the love. I hope to pass them on to my daughters someday and hope they will cherish them as much as I do. Thanks Christina for sharing your lovely collection with us! If you'd like to see some of Christina's work you can visit her vintage shop on Etsy, Tangerine Chic. The Readers Collections have been a lot of fun. 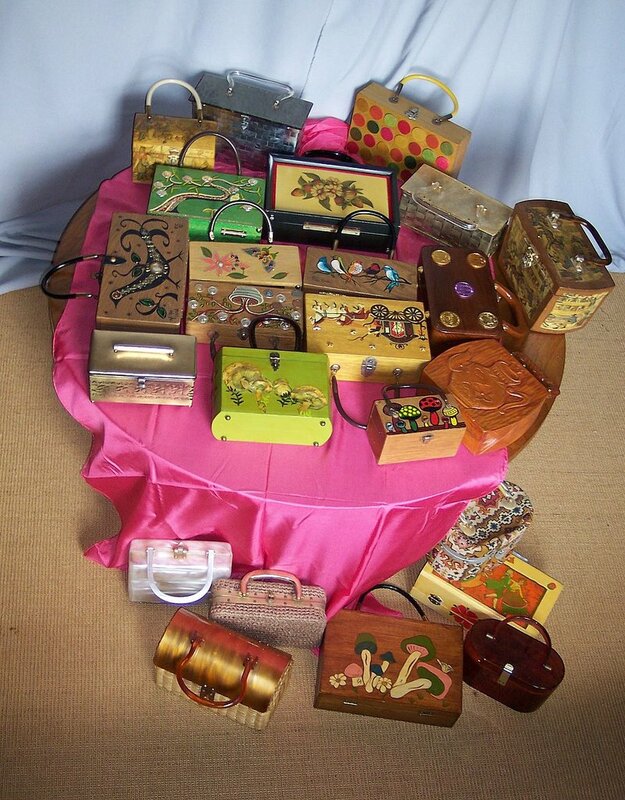 Today's collection feature is a look into the world of Vintage Box Purses. These come from Diane H. from Houston Texas. Talk about a collection, Diane's variety of box purses is truly amazing, there are so many great photos to share, so I included a mix of her personal collection as well as her personal collection she's parting with. I hope you will enjoy them and a little of their history as much as I did. Do you know anything about the history of when box bags first started being produced? 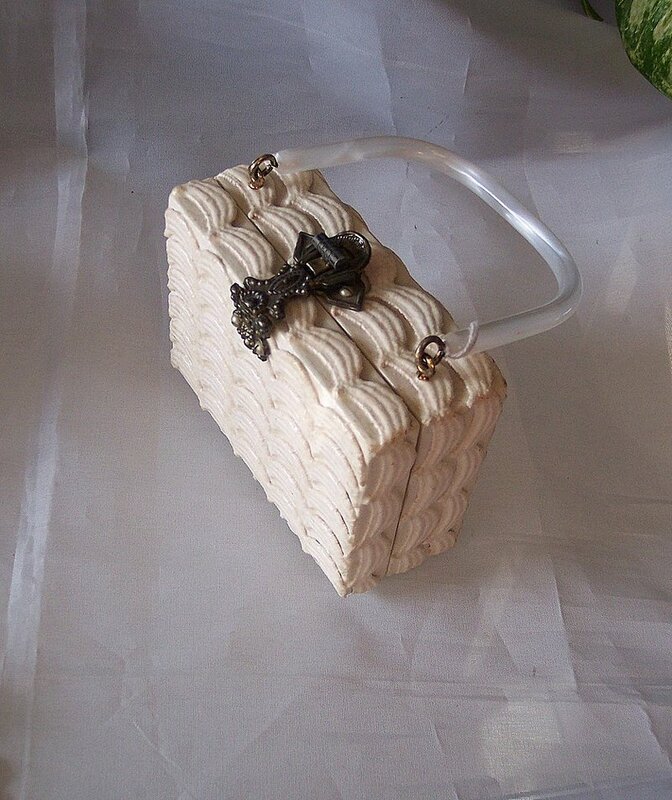 vanity item was made changed...tapestry fabric...leather...Bakelite..metal..plastic..WOOD. In tandem, shape changed as well. 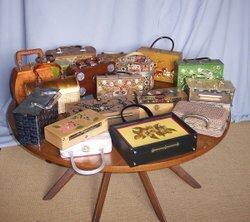 boxes, or six-sided boxes, and a nice velvet one from the 50's which is 12" tall and shaped like a stove pipe. 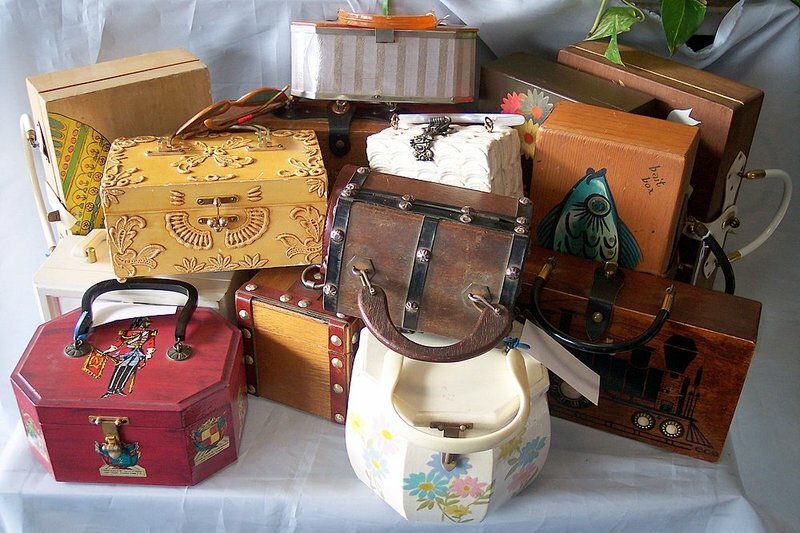 I classify all of these as box purses. The majority of my collection in the photo's, are from the 1960's -early 70's. Some were commercially produced, others were home-crafted from kits being sold at that time. 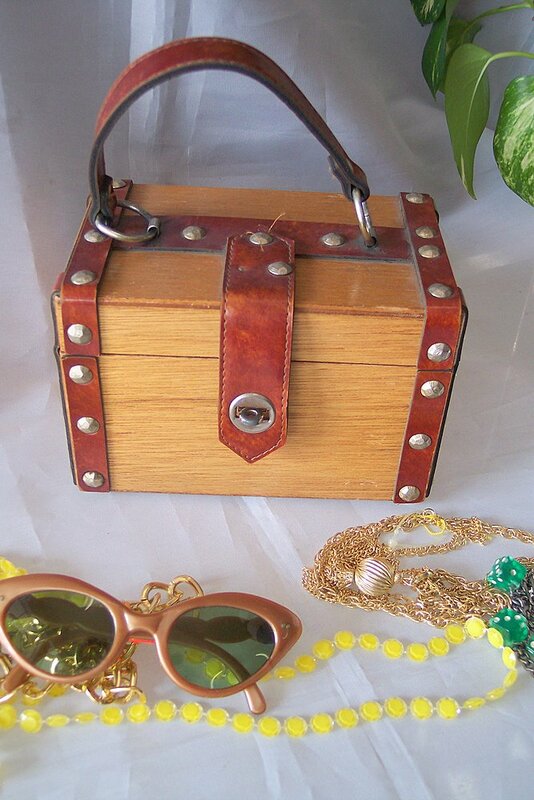 Enid Collins of Texas, started the craze for the Wooden Box Bag in the early 60's, and they were pricey. So of course, the knock-offs followed, along with the do-it-your-self themes. (Japan produced many of the Collins look-a-likes. What made you decide to start collecting these? (1950-70's), just smiled. They of course understood. Thanks Diane for sharing your wonderful collection with us! Welcome to another Reader Collection feature. Today we'll visit a collection that's very popular, Vintage Compacts. They come from Nicole a collector in Western Pennsylvania. This is the oldest compact in from her collection. A 1934 Chicago Century of Progress Fair compact. Why do you collect vintage compacts? This golden round compact once contained solid Estee Lauder perfume.Compacts held a wide range of cosmetics and substances, not just powders. 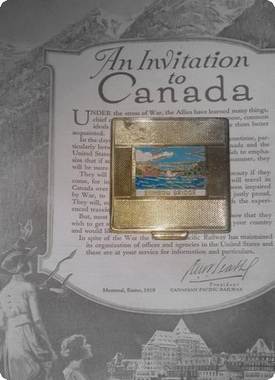 Souvenir compacts like this Canadian piece were made in the early part of this century when travel and vacation was still a novelty. 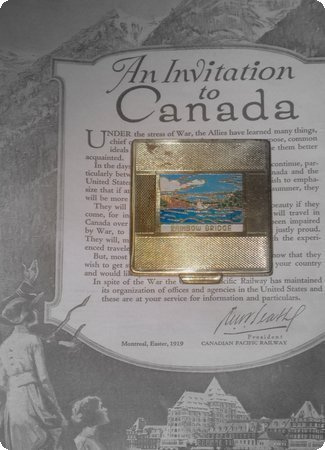 This Rainbow bridge compact was probably made 1940's, after Construction of the Rainbow Bridge in Niagara Falls. I’m about a decade behind on technology and fashion, I don’t even own an Ipod! 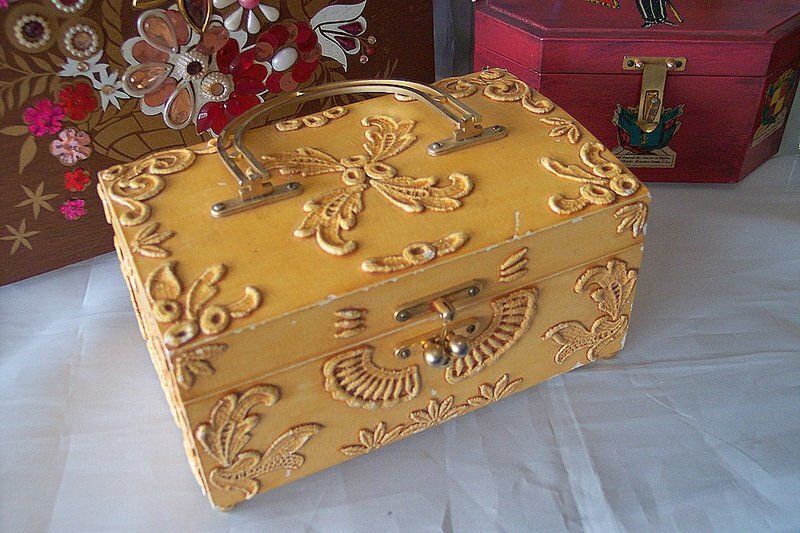 I believe vintage anything is a treasure waiting to be rediscovered. 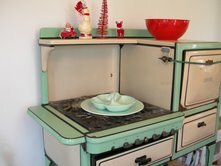 I love the “rediscovery” of vintage, everything old is new again. My life is like a never ending treasure hunt. I like the fact that recycling vintage, clothing, housewares etc.. Keeps our landfills from filling up. Vintage recycling is also good for our environment. 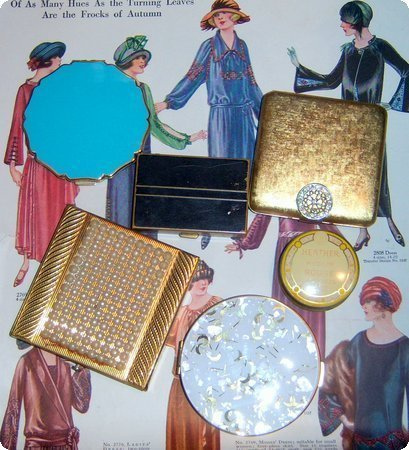 Thanks to Nicole for sharing your vintage compact collection with Vintage Indie. Nicole also happens to be the owner of a fun vintage shop. Vintage This Retro That, check out her shop for a great mix of vintage and modern supplies. Back again with a Vintage Collection feature. 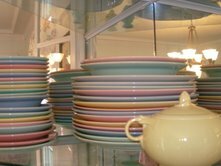 Today brings you a gorgeous set of Lu-Ray dishes. 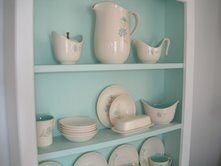 Heather from Peoria, IL is the lovely owner and I asked her a few questions about vintage and her love for these dishes. 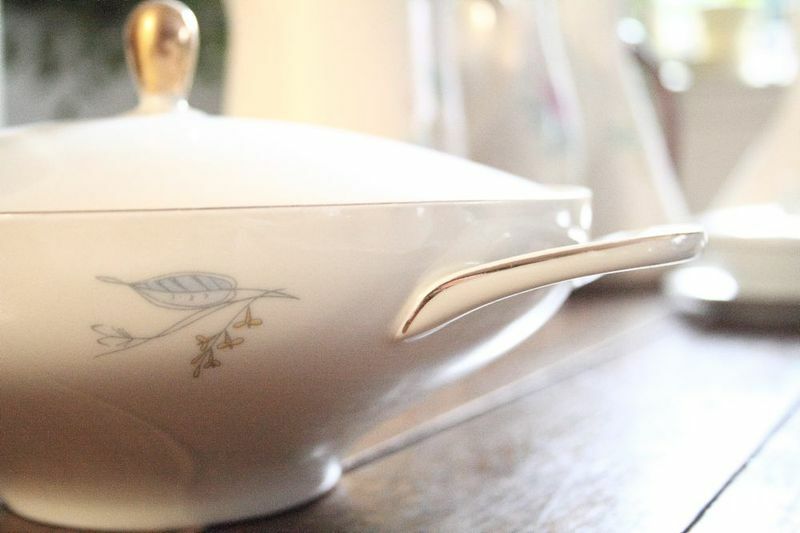 Why do you love vintage dishes? The colors! The blue-green called surf green is my favorite, with the rare gray color a close 2nd. 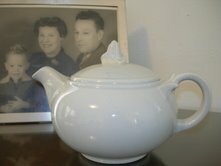 And I like to imagine my grandma(in one of the photographs behind the gray teapot) might have discussed a new set of Lu-ray with a traveling salesman. It just reminds me of a different kind of lifestyle. I would not have to drive a car everywhere and work would end at 5pm. Tell us about what you collect and why? My collection started with an impulse buy at an antique store. I had seen this beautiful green/blue colored plate at another store, but thought I would never see it again. Then I found another one, so I decided to purchase this one I had found. A little sugar bowl with blue flowers had also caught my eye. I bought them both. Then I looked up the name Lu-Ray, which was on the back of the plate, on ebay...my collection had begun! 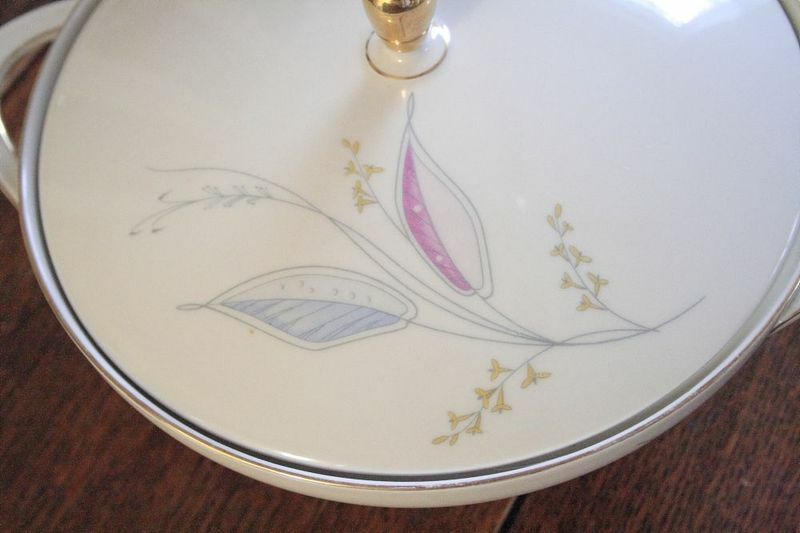 Then I looked up the name Taylor, Smith and Taylor who made Lu-ray and found they also designed the boutonnière sugar bowl I had found--another collection had begun. 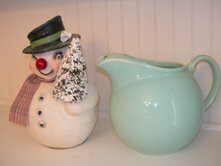 I have gone on to purchase other designs like Dwarf Pine, ballerina mist, Hall refrigerator dishes, Brookpark melmac--I want to give them all a home. What's missing from your collection that you've just got to have? I would like to get a surf green Lu-Ray cake platter. Thanks again to Heather for sharing this wonderful set with us! While your out doing some shopping check out Heathers shop on Etsy called rowdyharv . She's got some really great mixed media art and more! Vintage - What do you Collect? Chances are if you are here for vintage, than you probably collect something. As an avid thrifter and antique shopper I'm always on the lookout for something special, but I haven't really pinpointed something I would like to collect besides glass juicers. My collection consists of two. I've hooked up with some avid vintage shoppers to find out what they collect and I'll be sharing their collections and stories with you in our new What do you Collect feature. The first one comes from Martha from Chico, CA. She collects vintage cookbooks. I wanted to know a little more about her collection. Follow this for a short interview! 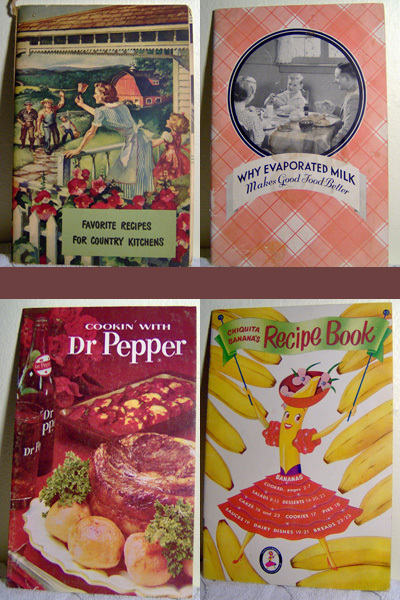 Why do you collect vintage cook books? phase where I couldn't get enough of them. Fortunately, I have it under control now. What draws you to purchase one, when you see it? words "Gel-Cookery", "Meat", or "Food For Victory". Thanks Martha for a look into your collection! While your out shopping this year head over to Martha's Etsy shop Blue Rosetta Knits.